Every SMS marketing offer, unless it’s a complete failure, will boast decent redemption. But how do you take it one step further? How do you separate a good offer from a great one, and recognize the potential? Look out for these three tell tale signs. 1. Redemption rates that help you to maximize your profit potential. Make sure your offer redemption not only justifies your spend, but also exceeds it. For example, let’s say when you combine product cost and SMS expense, your investment totals $25 for one promotional campaign. You want to make sure you’re ROI exceeds this number. 2. Positive feedback pours in from subscribers. Your subscribers can’t get enough of your offers. Not only do they redeem (almost) every single time, but they’re also ready and waiting for the next offer to come their way. They express their interest in the current offers, and look forward to future promotions. 3. Non subscribers inquire about how to take advantage of these offers. Not every customer will also be a subscriber on your list. How do you encourage new sign-ups? Make sure every single customer knows about your deals. This means displaying promotional materials in store, promoting the list on social media, engaging in word of mouth invitations, and more. 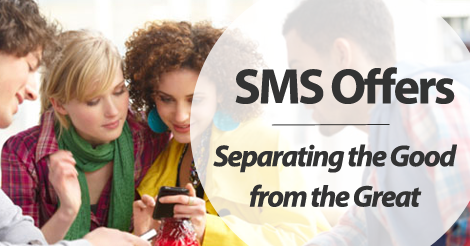 Generally speaking, your SMS marketing redemption rates are really only as good as your offers. If the incentive just isn’t there, people won’t rush to redeem. On the same end, you want the majority of your offers to be irresistible. Stay away from basic 10% off coupon codes, for example. These do borderline nothing for redemption. Join forces with top SMS marketing provider, SlickText.com. Give us a buzz at 1.800.688.6290 or head over to the pricing page to sign up for a free plan. Our educational resources make it easy for you to capitalize on this text marketing method.